An international team of researchers, with the assistance of amateur astronomers, have discovered a unique binary star system: the first known such system where one star completely eclipses the other. It is a type of two-star system known as a Cataclysmic Variable, where one super dense white dwarf star is stealing gas from its companion star, effectively 'cannibalizing' it. The system could also be an important laboratory for studying ultra-bright supernova explosions, which are a vital tool for measuring the expansion of the Universe. Details of the new research will be published in the journal Monthly Notices of the Royal Astronomical Society. The system, named Gaia14aae, is located about 730 light years away in the Draco constellation. It was discovered by the European Space Agency's Gaia satellite in August 2014 when it suddenly became five times brighter over the course of a single day. Astronomers led by the University of Cambridge analysed the information from Gaia and determined that the sudden outburst was due to the fact that the white dwarf – which is so dense that a teaspoonful of material from it would weigh as much as an elephant – is devouring its larger companion. Additional observations of the system made by the Center for Backyard Astrophysics (CBA), a collaboration of amateur and professional astronomers, found that the system is a rare eclipsing binary, where one star passes directly in front of the other, completely blocking it out when viewed from Earth. The two stars are tightly orbiting each other, so a total eclipse occurs roughly every 50 minutes. "It's rare to see a binary system so well-aligned" said Dr Heather Campbell of Cambridge's Institute of Astronomy, who led the follow-up campaign for Gaia14aae. "Because of this, we can measure the system with great precision in order to figure out what these systems are made of and how they evolved. It's a fascinating system – there's a lot to be learned from it." Using spectroscopy from the William Herschel Telescope in the Canary Islands, Campbell and her colleagues found that Gaia14aae contains large amounts of helium, but no hydrogen, which is highly unusual as hydrogen is the most common element in the Universe. The lack of hydrogen allowed them to classify Gaia14aae as a very rare type of system known as an AM Canum Venaticorum (AM CVn), a type of Cataclysmic Variable system where both stars have lost all of their hydrogen. This is the first known AM CVn system where one star totally eclipses the other. "It's really cool that the first time that one of these systems was discovered to have one star completely eclipsing the other, that it was amateur astronomers who made the discovery and alerted us," said Campbell. "This really highlights the vital contribution that amateur astronomers make to cutting edge scientific research." AM CVn systems consist of a small and hot white dwarf star which is devouring its larger companion. The gravitational effects from the hot and superdense white dwarf are so strong that it has forced the companion star to swell up like a massive balloon and move towards it. The companion star is about 125 times the volume of our sun, and towers over the tiny white dwarf, which is about the size of the Earth – this is similar to comparing a hot air balloon and a marble. However, the companion star is lightweight, weighing in at only one percent of the white dwarf's mass. AM CVn systems are prized by astronomers, as they could hold the key to one of the greatest mysteries in modern astrophysics: what causes Ia supernova explosions? This type of supernova, which occurs in binary systems, is important in astrophysics as their extreme brightness makes them an important tool to measure the expansion of the Universe. 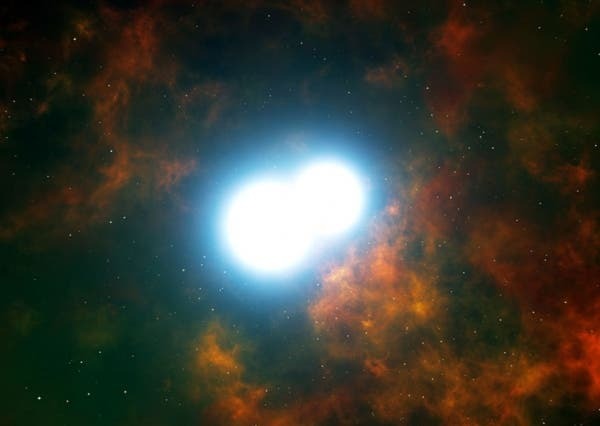 In the case of Gaia14aae, it's not known whether the two stars will collide and cause a supernova explosion, or whether the white dwarf will completely devour its companion first. "Every now and then, these sorts of binary systems may explode as supernovae, so studying Gaia14aae helps us understand the brightest explosions in the Universe," said Dr Morgan Fraser of the Institute of Astronomy. "This is an exquisite system: a very rare type of binary system in which the component stars complete orbits faster than the minute hand of a clock, oriented so that one eclipses the other," said Professor Tom Marsh of the University of Warwick. "We will be able to measure their sizes and masses to a higher accuracy than any similar system; it whets the appetite for the many new discoveries I expect from the Gaia satellite." "This is an awesome first catch for Gaia, but we want it to be the first of many," said the Institute of Astronomy's Dr Simon Hodgkin, who is leading the search for more transients in Gaia data. "Gaia has already found hundreds of transients in its first few months of operation, and we know there are many more out there for us to find." Gaia's mission, funded by the European Space Agency and involving scientists from across Europe, is to make the largest, most precise, three-dimensional map of the Milky Way ever attempted. During its five-year mission, which began in late 2013, Gaia's billion-pixel camera will detect and very accurately measure the motion of stars in their orbit around the centre of the galaxy. It will observe each of the billion stars about a hundred times, helping us to understand the origin and evolution of the Milky Way. The follow-up campaign used several professional telescopes, including those located in the Canary Islands, where observing time was made available through the International Time Program. Image at top of the page shows a pair of white dwarf stars at the center of a planetary nebula called Henize 2-428 so close to each other they are bound to merge into a single star and explode into supernova in 700 million years. Beyond the Big Bang –"Is a Fundamental Rethink Required?"